How to: earn money online with Quora?! In the last month, I’ve started to check out Quora for the first time. While I’d seen it about – it tends to pop up in the search results – I didn’t pay it any attention. But that was a mistake! Recently, I read a blog post in an online community where I’m a member – and it was talking about driving traffic to your website or blog with Quora. Suitably intrigued, I decided to check it out. 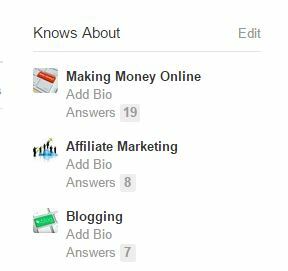 As it turns out, there are a lot of people on Quora interested in making money online and since that’s my own topic of interest, I found it pretty straight forward to start answering questions in the make money online niche. 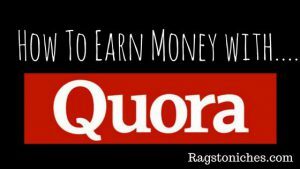 One of the questions I answered recently was: How do I make money with Quora? The question sparked my interest because I realised some people were confused – they thought there was a direct way that you make money with Quora, but really, it’s an indirect relationship. Quora is simply an online platform where a community of people can ask a question and get a bunch of responses from who ever is there to answer. Questions and answers can be edited, as well as edits suggested by other members. Quora became available to the public in 2010 and grew to over 500,000 registered users by 2011… that’s some extensive growth! Answering questions on Quora is a great way to get your name, brand, website or business out there for people to see. While there are some guidelines Quora has regarding self promotion, (make sure you check their guidelines! I didn’t at first…ooops) you can certainly drive traffic to relevant pages of your blog or site that will help them. However, you’ll want to try and answer the question in full as it is and just add links to back up what you’re saying and it will bode you well to link to other relevant sources – not just your website. You can also add your website link to your profile, (as well as any other beneficial ones you’d like to add – such as to your social media profiles!). The fact is, if you’re purely relying on FREE methods to drive traffic to your website or blog, you will have realised by now that generating traffic is not the easiest of tasks. but to find some really targeted visitors to your blog, Quora can be a great opportunity for finding people who are looking for content JUST LIKE YOURS! When I joined Quora – I was sceptical. When I signed up to Quora, I actually had extremely low expectations. The appearance of the site is certainly nothing spectacular and the general feeling of it felt a bit like a disorganised filing cabinet – with random papers falling out all over the place. Although, granted, the bits of paper falling out all over the place WERE ones that were often relevant. The ones I had been actually been looking for. See, when you sign up – you let Quora know what your expertise is, or your interests are. As you start answering questions, Quora also keeps track of what kind of topics you’re answering questions on. People then start to request your answers to certain questions that are relevant to you. I’d only started answering a couple of questions when I started to get requests. Around a month on, I definitely do get a bunch that are pretty irrelevant to me – but there are enough that are and the great thing is, the more you answer, the more relevant questions you’re going to be sent. In addition, if you answer questions really well, people upvote your answer. The more upvotes you get, the more people are going to see your answer – and so the cycle continues. Quora – The traffic possibilities! Now, I have only been on Quora for just over two weeks. I’ve answered 40-something questions. Most of those questions were actually answered sporadically, some days I’d answer a whole bunch and then I’d go for days answering none. 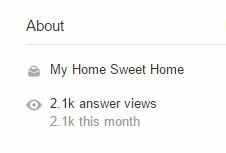 My Quora Answer views to date? OVER 2.1 thousand views to my answers… not too shabby! Over two thousand views in just over two weeks. While not all these views have converted into traffic visiting my site, this certainly opens my eyes to future possibilities. I’ve also made some sure sales as a direct result of answering questions on Quora. The other great thing is, you won’t just generate traffic in the short term. Questions you answer today, could continue to drive traffic to your website months after you initially answer them. I’ve personally seen some truly EPIC answers on Quora and unsurprisingly these answers are upvoted multiple times over, breathing life into them and pushing them up in the rankings. Who will then upvote and so on and so on. Now, I hold my hands up: my effort with Quora has been minimal so far. I’ve given pretty quick, to the point answers and made very little effort with it, so far. But clearly it PAYS to spend the time to actually create some awesome answers that will stand out from the crowd and be upvoted. People who take the time to do this, will be rightly rewarded. One way you could do this, is to write answers in advance that could be easily adjusted depending on the question. For example, there are tonnes of questions relating to e.g. “how to make money from a blog” and this sort of answer would be very simple to write up in advance and slightly change to fit the exact question. That way, you could really spend the time to create a fantastic answer, that everyone will be praising you for, (and more importantly – UPVOTING!). **update: I had a long break from QUORA, after they really came down hard on any self promotion. I was banned from writing and editing more than once………and I’m still not entirely sure what is/isn’t allowed. So, play cautiously! Major Perk: Quora Can Even Get You Noticed By High Authority Sites! Yes indeed… even sites like Forbes are now sourcing content from Quora and featuring some of the best posts on their site. It could also end up generating you even more exposure than you ever thought possible! While I’ve only recently joined, I’m certainly very encouraged by what I’ve experienced so far. With so many bloggers struggling to get their voices heard, this does provide a platform for many to share their knowledge and passion with a large audience – and actually gain real tangible benefits from it. **update – Quora answers now regularly feature at the top of the Google search results. What can I say? Watch this space and get yourself over to Quora! Have you had any experience with Quora yet? Leave me a comment, I’d love to hear about it. There are many user use quora for getting information for allthings. I want to work part time and this blogs give me idea about how to earn money online. you can also check another website which i have just found that will also help. Very well explained. Was looking for these answers for quite a long time. Thanks and good luck to you. Hi Zoya! You’re very welcome, thanks for taking the time out to comment. Good luck to you too! What do you think about creating 200 accounts for a start, answering with copy/pasted content that fits the question, so that you give some authority to accounts, and all these take time I know; but what do you think about doing this and then using it for driving traffic to anything you want. You can make your question, have it answered by other people but you can also reply to your own question and upvote yourself and downvote others if needed. With your links and such, and some other organized elements, this could work pretty good right? Boy… well, creating 200 different accounts would certainly be time consuming. You could potentially drive things to whatever you want – however, Quora asks you to disclose if you’re directing straight to an affiliate link, or even to a review post that links out to something/or a sales page. People can get fed up with that and report you too. Basically, if it appears you’re being spammy, they’ll close your account. So, there is a fine line. However, say you became an expert in various niches – I’m sure plenty of bloggers would probably pay good money to be mentioned by someone who is considered an expert and gets upvoted a lot! A Bit blackhat is that. There will be consequences. Wouldn’t it just be better to be straightforward with one account and put all of your energy into giving awesome answers to people’s questions? It would be less work than creating 200 spammy accounts to answer your own questions, but with the added benefit of feeling your rewards are completely warranted. Hey James – yes, I agree, it is blackhat. Not something I’d do personally, but I’m guessing people could do something along those lines. Although 200 accounts is way overboard. Write awesome answers that people will naturally upvote. Plus, spreading yourself over multiple accounts like that really would be too time consuming anyway, you’d need to be outsourcing help really to make it work effectively – to have enough answers written and so on to actually build a reputation. Plus, if you’re just direct linking to some product or service affiliate link, you’ll likely be reported and banned anyway. Thanks for stopping by. I’ve already read some posts related to making money with Quora but you have written great content. Nice information. Thank you for sharing and keep up the good work. How can i get invitation from quora for partnership program? I’m actually unsure about the Quora partner program! It’s something I have to look into. Thanks!